Baking with whole-grain flours used to be about making food that was good for you, not food that necessarily tasted good, too. 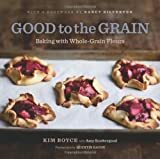 But Kim Boyce truly has reinvented the wheel with this collection of 75 recipes that feature 12 different kinds of whole-grain flours, from amaranth to teff, proving that whole-grain baking is more about incredible flavors and textures than anything else. When Boyce, a former pastry chef at Spago and Campanile, left the kitchen to raise a family, she was determined to create delicious cakes, muffins, breads, tarts, and cookies that her kids (and everybody else) would love. She began experimenting with whole-grain flours, and Good to the Grain is the happy result. The cookbook proves that whole-grain baking can be easily done with a pastry chef’s flair. Plus, there’s a chapter on making jams, compotes, and fruit butters with seasonal fruits that help bring out the wonderfully complex flavors of whole-grain flours.